The 2014 Geenland Inland Traverse team (L-R): Erik Lund, Pat Smith, Robin Davies, Galen Dossin, Ben Toth. After enduring a series of storms, the GrIT operations and SAGE research teams used a break in the weather on Monday to launch SAGE ahead of GrIT. The GrIT tractors and loads were buried under enormous snow drifts, most of which would need to be hand-excavated to avoid damage, and final preparations would likely take another two days. The SAGE traverse with their cargo train getting ready to leave Monday morning. 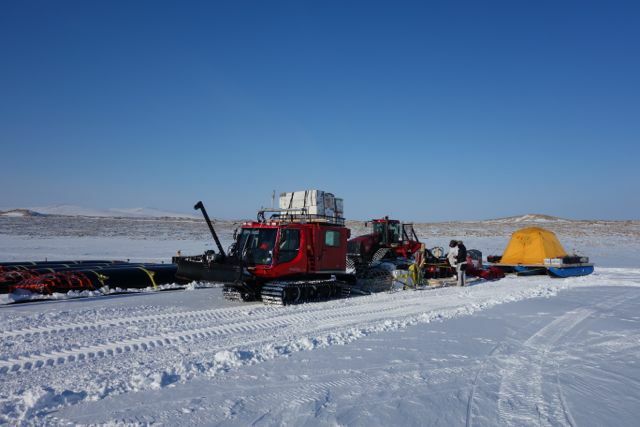 So, instead of waiting for the GrIT tractors to lead them through the crevasse zone, the SAGE science team started off with PFS's Galen Dossin driving a Tucker to assist in pulling their heavy load up the long, steep hill between land and the inland ice sheet. Back at the transition, the GrIT team set to and departed on Wednesday, as GrIT Project Manager Geoff Phillips writes in his latest report, excerpted below. The GrIT 2014 is officially underway and en route to Summit Station. 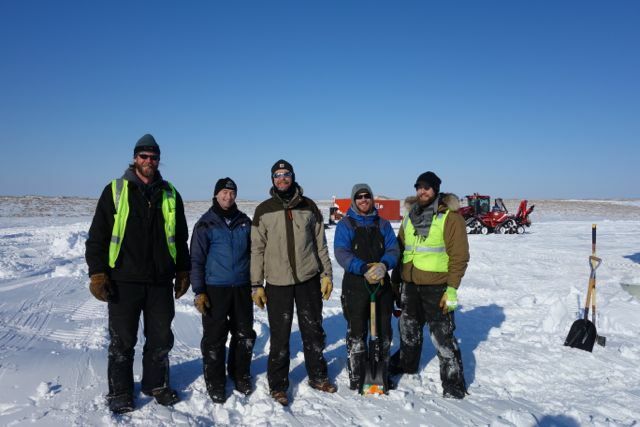 The crew consists of three veterans (Pat Smith, Robin Davies, and Galen Dossin) and two South Pole Overland Traverse veterans (Erik Lund and Ben Toth). It is easy to spot who is who by the way they tow their loads. All the sleds will be double-hauled (two tractors per sled) up through the steep crevasse sections but not all the same way. The SPOT guys prefer to double haul in single file and the GrIT crew prefers side-by-side. Both have advantages and disadvantages and it will be good to see if one proves better for Greenland snow conditions.